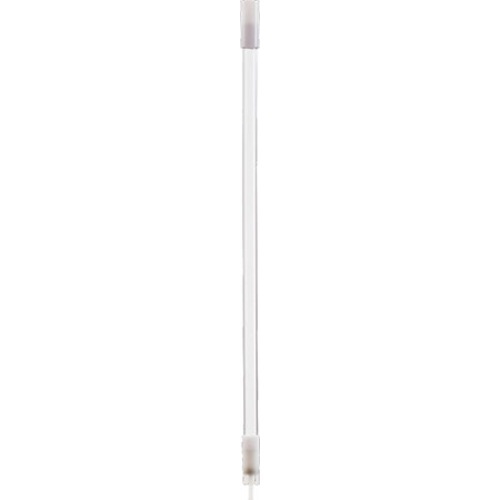 Add convenience and reduce the mess of bottling with this bottling wand! Say goodbye to the days of just running a tube from your bottling bucket's spigot into the bottom of the bottle. A bottling wand starts its flow when you press the wand tip against the bottom of the bottle, and stops when you lower the bottle away from it. No more having to fiddle with the spigot during bottling, and no more mess from the dripping hose between bottles! What does this bottle filler have that the rest don't? A removable tip and spring that make this model easy to sanitize. Plus, the nozzle spring can be removed if you prefer the action of a springless bottle filler. The actual "wand" on the filler is 15 inches long. Nice simple piece. My first one lasted for over 5 years. So much easier to use this than pinching off the tube. Back-up for the old one I am presently using. It started to drip. My current filler doesn't have spring action. Gave my other spring loaded one to my daughter. My mistake. Spring must be better than no spring, right? I used my new bottle filler soon after it arrived and was pleased with the way it performed. No leaking like I've had with others in the past. It made filling two cases of bottles fairly quick and efficient. Love the versatility of this unit. It has a fitting on the top that allows you to attach it on a party tap dispenser and fill bottles. You can also remove the bottom tip and fill bottles and growlers using your party tap. One thing about it when it arrived I couldn't get it apart. I just warmed some water in the microwave and soaked the bottom end about 2 minutes and off she came. Works like a charm, no more leaks while filling bottles, better that the last one i had. Easy to use, easy to clean, leaks a little but not a big deal. Not hard to pull apart. Helps quick fills. Really like the new bottle filler, plumbed it for my sanke kegs . Works great to do up a few bottles or growlers . One of the best inexpensive, useful, and easy to use and clean. Besides filling bottles quickly and easily without oxygenating during the fill, this is an efficient racking device instead of using plastic tubes that have a permanent bend and are harder to maneuver when transfering the wort from kettle/carboy to carboy. I use it to rack from my primary fermentation carboy to my secondary by easily attaching it to my spigoted carboy. The glass tube is easy to sanitize and the tip with pin and spring detach in a snap to also clean and dry. I have loved mine for 3 years and it still looks new. A must! Leaks a little, but haven't found one that doesn't. I can't even imagine a better or easier way to fill bottles from a bottling bucket. It's easy to clean and sanitize too. Works great but I don't think the spring is made from ss. Would be a five star review if the spring was ss. Making the Bottling Process STUPID Simple! I watched some home brewing videos where I saw this product, and just knew I needed it. The spring loaded "on/off" for the flow makes going from bottle to bottle simple and no mess! If you are not kegging, you NEED this as a part of your home brew tool kit! if you are bottling then buy this. This has helped out with so many batches of beer I cant remember. Wouldn't bottle with out it. Starts when you push down and stops when you lift up. Doesn't drip. Does exactly what it is supposed to do. The tip has a couple removable parts that need to be cleaned after each use. Don't loose the tiny spring! I would have given this product 5 stars, but after about a year it's started to develop a small drip. Still works, but it's a bit messy. Works great for bottling beer. Dribbles a little from time to time but seems to be well made with a strong enough spring to shut off the flow. can't bottle beer without a filler. this one is nice because it has the spring mechanism, so if you arfen't pushing down, the beer stops flowing. this lets you rest it in an empty bottle while you cap the ones you have filled, and set out more bottles. If you bottle, you need this. No muss, no fuss - forget clamps, spills, dribbles, drool and sticky floors. Simple, efficient, fills bottles to perfect volume without stressing. Buy it. You'll thank yourself. Comes apart nicely for cleaning, and holds tight during filling. The clear tube is perfect so you can tell when you are starting to pull trub. As simple as it gets ! This bottle filler works really well. 3/8 hose fits just right without the need for any hose clamps too! I've had mine for 7 years and have never had an issue with it. They seem to last forever. This spring loaded bottle wand is a big improvement from the generic ones that come with some other starter kits. This small upgrade nearly eliminated my cleanup after bottling. This is very easy to use, clean and it's inexpensive. When filling bottles, just press down the spring, fill to the very top, then remove the wand for the perfect headspace every time. The wand displaces the liquid just the right amount. So much easier and no spilled beer compared to using hose clips or trying to pinch the hose. I can't imagine why anyone would try to bottle without one of these. Using a 1" piece of tubing, this attaches to the spigot of a bottling bucket so you can have both hands free to handle the bottles. You can also take the end cap off, spray it with starsan and use it as a pipette to get samples out of a fermenter for SG readings. If you fill the bottle right to the top and then lift it (It takes a bit of practice but then you get the hang of it), the flow stops very quickly and it puts a perfect amount of brew into your bottles. The little tip is quite sensitive so it doesn't take much to stop the flow. Works much better than I expected for something that seems so simple in design. Easy to clean as well, it comes all apart. This bottling wand flows well and can be disassembled for cleaning. It leaves the perfect amount of headspace and prevents overflows. This was a great item to have on bottling day. A much easier way to fill on bottling day. Cleaning and sanitizing the bottle filler was very simple as advertised. I would put this on the "Must Have" list to anyone starting out with home brewing. A brewing gadget that works exactly as advertised. This is such a simple device but it makes life so much easier on bottling day. Reliable and easy to clean. I fill my bottles until they are completely full with the bottle filler inserted and then remove the filler. The empty volume left behind is always the same and is just right for carbonation.